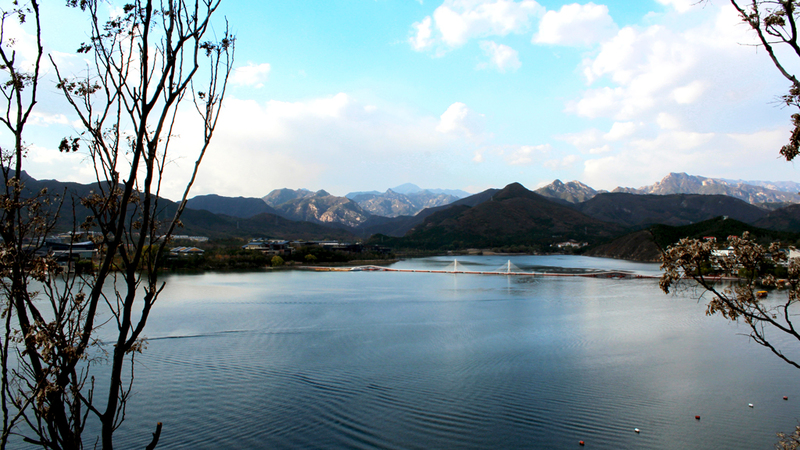 In Brief: A relaxing stroll that follows a stream through a wooded valley, passing pools and sandy beaches on the way to the end, plus a short post-lunch stroll by beautiful Yanqi Lake. Newly added. Crossing a wooden bridge in Intelligence Valley. Replacement hike—we'd planned to do the War Tunnels walk, but the area is shut down for hiking because of a brush fire. Why is this hike called Intelligence Valley? 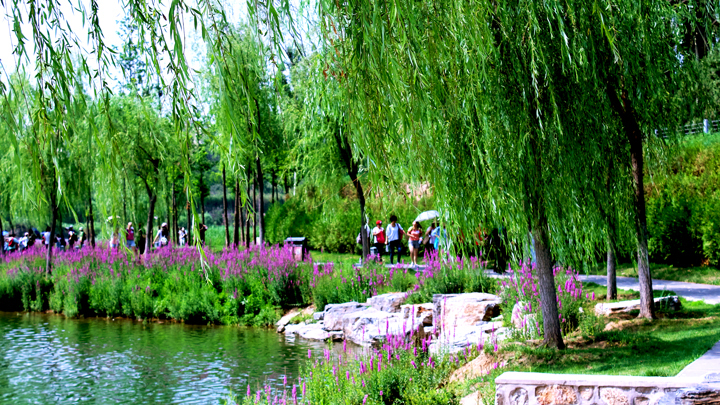 Because – it's said – that if you walk down the valley, you will become more intelligent! Try it out! And be sure to not walk up the valley—you might lose some of your smarts! 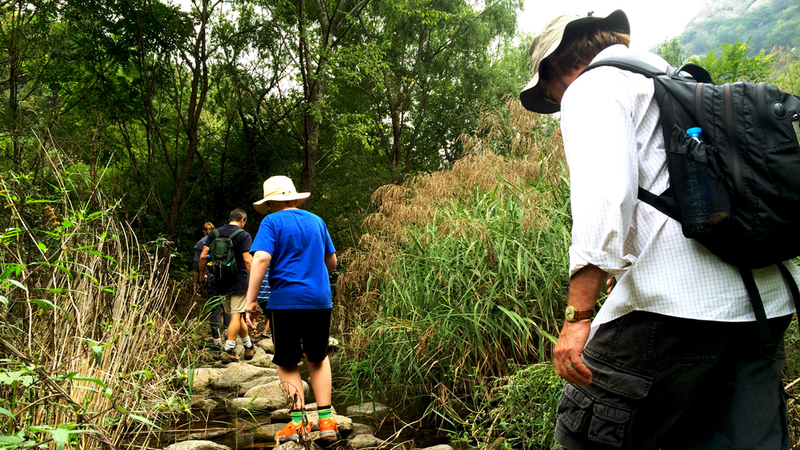 The Intelligence Valley hike is one of the easiest ones we've got, and it's a good choice for young children. It's a flat hike, and the path takes us alongside a stream and over rocks as we walk down through the valley. We've got some walking sticks to bring along - these will assist with balance in slippery spots. 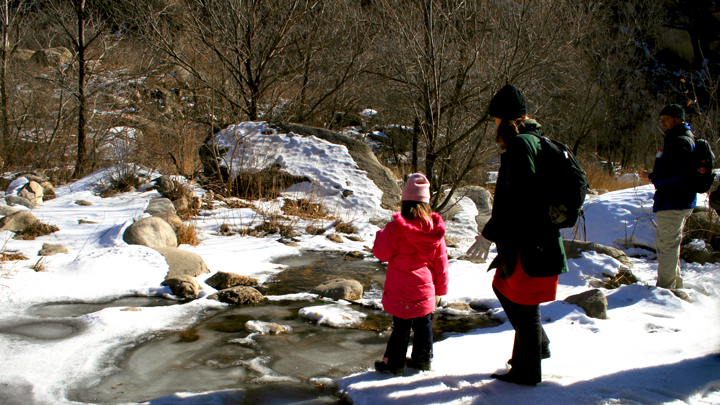 At this time of year all the streams and pools should be open, and might see a just a little bit of ice left over from winter. Along the way are several swimming holes. The biggest of these is near the end of the hike, and is called the Dragon Pool. Way too cold for a swim today, though! 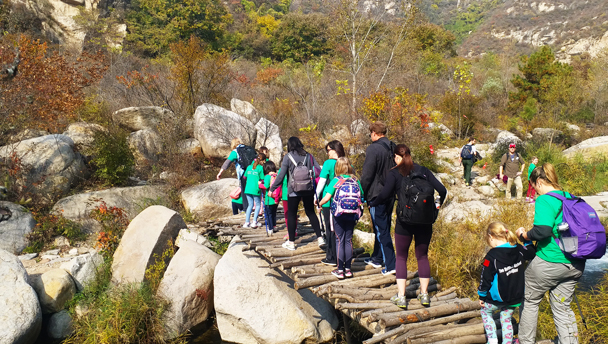 After finishing our walk through the valley we will arrive at Shentangyu Park, and walk out to meet our bus, and we'll then get a nice hot meal at a nearby restaurant. 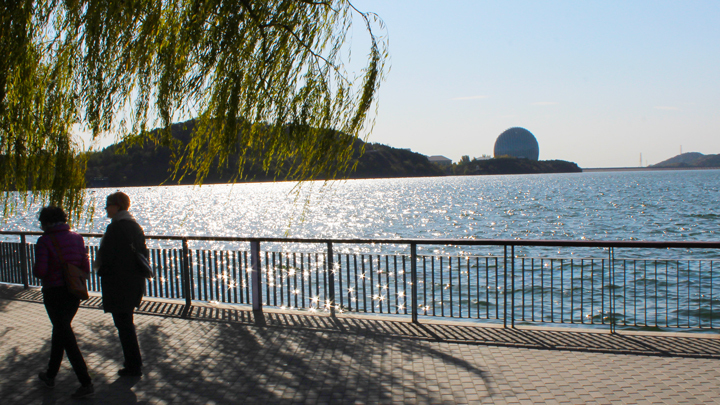 On the way back to the city we'll stop off for a stroll along the nature trail that runs around Yanqi Lake. 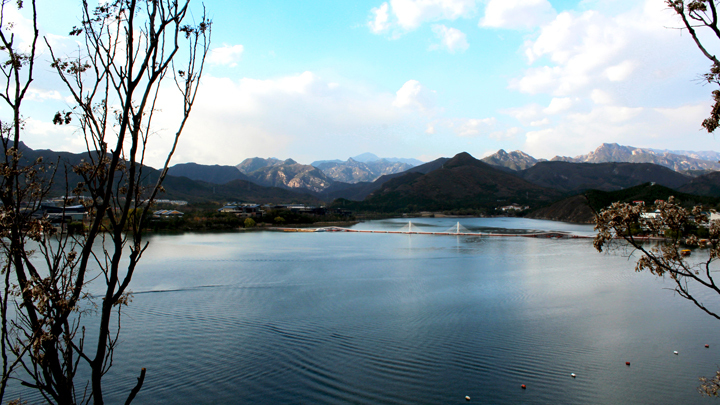 Yanqi Lake was the location for the 2014 APEC conference, and the area around the lake was extensively landscaped as part of the preparations for the event. 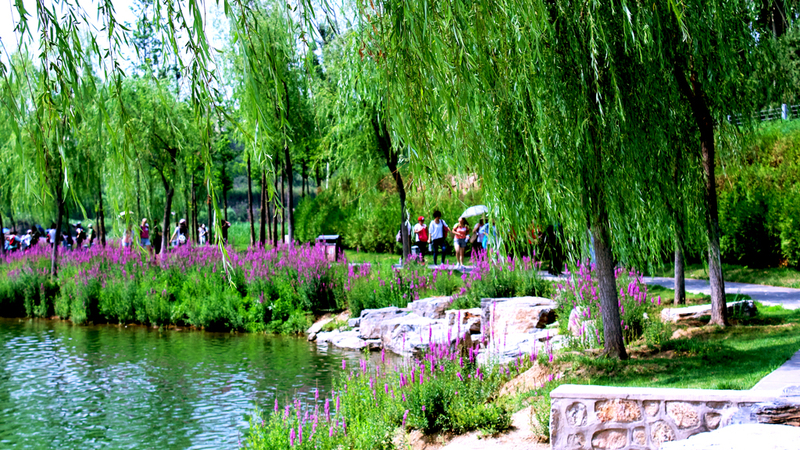 Part of the landscaping included a trail around the lake, and we'll walk the northeastern segment of it. It's a pretty walk, with the trail following the edge of the lake—almost all flat, but with some short climbs up into a small pine forest. 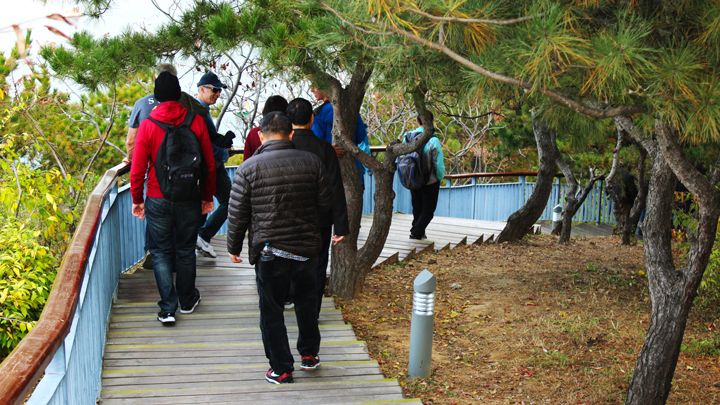 We've done this trail a few times as part of teambuilding events, and it's a lovely walk. It's a short hike, and we take it really slow. The Intelligence Valley hike is a popular one that we’re offering twice every season in order to appreciate and enjoy the contrasts that each season offers. The scenery varies greatly from one season to another, as we saw during our spring hike in mid May. Click through for photos and more! The Intelligence Valley hike is a popular one that we’re offering twice every season in order to appreciate and enjoy the contrasts that each season offers. The scenery varies greatly from one season to another, as we saw during our spring hike in early May. Click through for photos and more! Intelligence Valley is a popular hike, so we made it part of our Seasons Series. 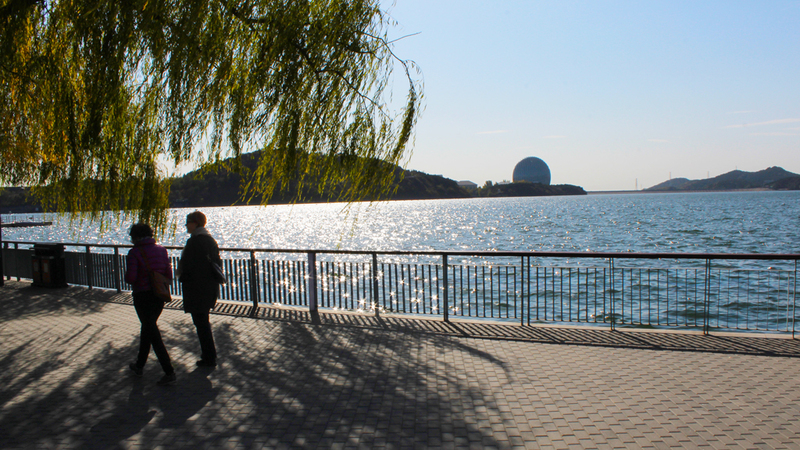 We’ll be repeating it in the spring, summer, and autumn to see how the local scenery changes throughout the year. Although there was not any snow on this hike, the river was frozen and we still got to see some very impressive icefalls.